Home > Healthy Hair > What is the Normal Cycle of Hair Loss and Regrowth? Hair growth, like all other functions of the body, has a normal cycle that it follows in every individual. Unless something like disease or unnatural events interrupts that cycle, the hair growth maintains a natural, consistent course throughout the lifetime of each person. The normal cycle of hair loss and regrowth contains three phases: the growing cycle, also called the anagen phase; the resting cycle, also called the telogen phase; and the shedding cycle, also called the catagen phase. Each phase has a predetermined duration and place in the normal hair growth cycle. Each cycle is unique to each hair follicle as each follicle operates independently from all of the other follicles. The normal hair growth cycle is stimulated and maintained by the release of hormones that are targeted at the hair follicles. These hormones keep the growth cycle on track and allow for consistent hair growth. Although each cycle is unique there are some basic similarities from cycle to cycle. The growing phase of the normal hair growth cycle is responsible for producing new hair and for allowing the continued lengthening of that new hair. In this cycle hair is produced at the root and growth is maintained through the blood vessels, which feed the hair strand its nourishment. This phase lasts about four or five years and at any given time about 90% of the existing hair follicles are engaged in this phase. At the end of the growing phase these follicles enter the resting phase. 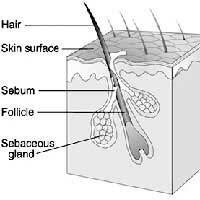 Once a hair follicle enters the resting phase its function is to maintain the existing hair strand at the existing hair length. During this time the hair follicle still receives nourishment but is in the process of preparing for hair strand shedding. The resting phase of each hair follicle lasts an average of two to four months after which time the hair strand is released so that the follicle can prepare for new hair growth. At any given time about 5% of the hair follicles in the scalp are engaged in the resting phases of the hair growth cycle. Once the resting phase is complete the shedding phase begins. The shedding phase of the hair growth cycle is the shortest phase. During this part of the cycle old hair strands are released so that the hair follicle can begin new hair growth. Once this phase is complete the cycle begins again and the follicle enters the growth phase for another four or five years. Each day anywhere from 50 to 100 hair strands are shed during the normal process of this phase. This is also the phase that is most associated with baldness. If a person is suffering from Alopecia or Hair Loss they will first notice an abnormally high rate of shedding. At first this excessive hair loss will result in hair thinning but the end result could be baldness. Abnormal hair loss or shedding is defined as the loss of more than 150 hair strands each day for an extended period of time. If the abnormal pattern continues individuals are encouraged to See A Doctor about the hair loss. Will taking multivitamin help your hair thicken up after the hair has thinning out!